Sweet holiday dreams are made of this! On the the bottom is a joyful flurry of little red and white striped candy canes dancing all over the background, along with little star-shaped bright red flowers and berries and pine needles and snowflakes. The joyous hand-scripted letter style speaks eloquently of your joy, you need say no more with this holiday style. 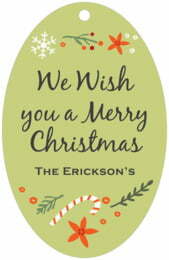 Customize your Floral Candycane canning hang tags today! Floral Candycane canning hangtags and food tags are printed on extra-thick cover weight white paper and come in a variety of sizes and shapes, including square, circle, a scallop-edged circle, ovals, plus other more intricate shapes. They are printed on one side, and are blank white on the back. You have the additional option to add text on the back for a small fee - just ask! Evermine canning jar tags come pre-punched with a small round hole to thread your choice of tying material. They are punched out individually and packaged as a set in small bags. 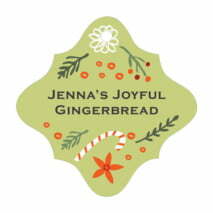 Select a shape above to start designing your Floral Candycane canning hangtags to get started!